Chinese observers have been holding different views on what lessons China, amid the transformative stage, could draw from the dissolution of Soviet Union. And how the dissolution has reshaped Russia keeps stirring up discussions among the Chinese public. 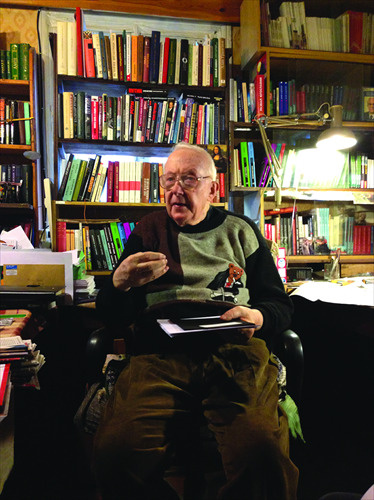 Roy Aleksandrovich Medvedev (Medvedev) is a renowned Russian historian and author of Let History Judge: The Origins and Consequences of Stalinism. He became a famous dissident after being expelled from the Soviet Communist Party in 1969 for challenging the regime from a critical Marxist perspective, and was later an advisor to then Soviet-leader Mikhail Gorbachev. Global Times (GT) reporters Huang Lei, Zeng Kun, Wang Qu and Song Shengxia interviewed Medvedev recently at his residence in suburban Moscow. GT: A recent Xinhua commentary by Wang Xiaoshi claimed that China would be worse off than Russia if there was unrest. What's your view? Medvedev: There are many interesting ideas in this article. In the 1990s, Russia was thrown into paralysis. The situation back then was very severe, and just like the article described, the threat of disintegration hung over the country. But I also have to point out that after Russian leader Vladimir Putin took office in 2000, positive changes took place in the following 14 years. Russia has avoided chaos and come back on track. GT: How would you compare China and Russia? Medvedev: There's no doubt that China has surpassed Russia in many aspects. But Russia is still ahead in many fields, which is to a large extent attributable to the foundation laid in the Soviet Union in the 1970s. For example, education in Russia is more advanced than in China. Russia's GDP per capita is also higher than that in China, and the social insurance system in Russia is more developed. In addition, Russia surpasses China in fields such as aviation and national defense. But over the past three decades, China has embarked on a path of sustained development, while Russia has experienced ups and downs before finally finding the drive of rejuvenation. GT: You were a dissident during the Soviet era, but later you regretted the dissolution of the Soviet Union. How do you see that part of history? Medvedev: After the disintegration of the Soviet Union, I co-founded the Socialist Party of Working People, which opposed then Russian president Boris Yeltsin. We tried to resume some policies implemented in the Soviet Union, restore people's recognition of the country, and rebuild a Russia-centered union. But we gradually realized it was impossible, and the party dissolved later. I was a dissident in the Soviet Union, but at that time I opposed the weakness and defects of the Soviet Union, not the entire Soviet Communist Party. I hold the same attitude toward the current Russian government. I believe that the path the Soviet Union followed was incorrect. It should have launched market-based reforms similar to China's. Gorbachev should have been prudent and careful in steering reform, rather than advocating new thinking and openly promoting extreme and radical reforms. He should have launched the economic reforms first and then political reforms. If he did that, the Soviet Union might have survived. It's very unfortunate that he left Russia an insurmountable mess. GT: What was the main reason for the dissolution of the Soviet Union? Medvedev: The main reason is the failure of the Soviet Communist Party in managing the country's ideology. The Soviet Union had a very unstable structure. Its foundation was not solid while it was developing. The Soviet people lost trust in the government because many defects, previously concealed deep, were exposed overnight when Gorbachev launched reforms. When the "Pandora's box" of democracy was opened, people were not ready. The problems accumulated over scores of years in the Soviet Union were exposed, causing a flush of criticism. People lost trust in Gorbachev and could not find other leaders that they could trust. The Soviet Union back then needed a leader who could unite and pull together all forces in the country. But unfortunately, the Soviet Union didn't have its own "Deng Xiaoping" but only had Yeltsin. GT: What lesson could China draw from the Soviet Union's collapse? Medvedev: The most important lesson that the Soviet collapse can provide to China is that China must manage its own pace of democratization. The Chinese government pays great attention to its internal problems and carefully deals with democratization. Over a dozen years, it has committed to building a democratic society. Freedom of speech and freedom of publication are gradually taking root. The progressive policies are right. China should support the people's wish for democracy. But such democracy should be controllable and should not be left unrestrained, otherwise it risks turning into a disaster. The Soviet collapse was not a consequence of democratization, but a disaster of uncontrolled democratization. I believe the CPC is a strong party with a strong leadership team. Of course, controllable democratization is difficult to manage. China is walking on the right path, but it still has a long way to go. GT: Do you think Russia can become a first-rank superpower again? Medvedev: Russia can no longer become a first-rank superpower again. Our economic power and population cannot reach the same heights. Although Russia has a strong military, nuclear capability and advanced aerospace technology, the development potential of Russia is smaller than that of China, the US, EU and even India. Russia still enjoys abundant resources. But these resources will finally be depleted. GT: Do you think Putin would agree with this view? Medvedev: I think so. Putin should have a clear understanding that Russia can no longer be a first-rank superpower. He is not an ideologist, but a pragmatist. But Russia also needs ideology, which Putin has not finally found. Currently, Putin unifies the country with patriotism. He has proposed that Russia should march forward. But the slogan is far from enough. Russia should find a unique development model, which is different to both the Western and Eastern ones. But Russia has not found such a model yet.